On Special! Click for details. Bienvenidos a Villa Encanto! In the small village of Bucerias, just 25 minutes north of the Puerto Vallarta International Airport, lies the private, ocean-front estate known as Villa Encanto. Recently renovated by its new owners, this magnificent villa is fully staffed and can accommodate up to 16 guests. The main house is over 5,000 square feet and consists of five beautifully decorated bedrooms that open on to private terraces, all with king size beds and private bathrooms. Two of the rooms have ocean views while the remaining three have pool views. Beyond the main house, in the center of the estate, is the junior size Olympic pool and guest house. 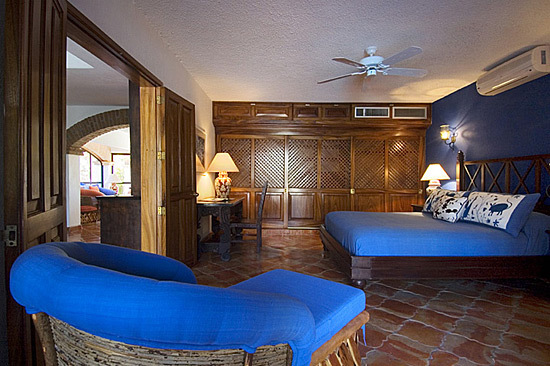 The guest house consists of two bedrooms, separated by a kitchenette, each with a private bathroom and a king size bed. Air conditioned throughout; individual thermostats in every room. Maids, cook, caretaker, gardener and bilingual property manger are included in the rental price. The property can also accommodate a small private wedding at an extra cost. Private massage services are also available at the villa. The home features a media room with a 42" wide screen TV (high definition), DVD and VCR player, satellite television, wireless high speed internet access, and "all in one" HP fax machine with printer, copier and scanner. There is also a dedicated phone line where guests can make unlimited calls to the US and Canada at no charge. The village of Bucerias has many wonderful restaurants and gift shops all within walking distance from the estate. There are also many leisure activities offered locally, such as, surfing, sport fishing, parasailing, jungle adventures, swimming with the dolphins and horseback riding. Bucerias is located between Puerto Vallarta and Four Seasons Resort in Punta Mita, approximately 25 minutes to either destination. Puerto Vallarta lies along Banderas Bay, the second largest bay in the Western Hemisphere. It is located 352 kilometers (219 miles) from Guadalajara, the state capital of Jalisco, and it is nestled in the foothills of the Sierra Madre mountain range. The region has many forests, rivers and waterfalls, with an average temperature of 27Â¡C (80Â¡F). Of its many attractions Playa Mismaloya, which gained fame from the film "The Night of the Iguana", is a popular celebrity hangout. The impressive rock formations of Los Arcos emerge from the bay's crystalline waters, which are great for diving and discovering incredible underwater mountains and steeps. The city hall has murals painted by Manuel Lepe, and the Malecon (sea wall) is adorned with romantic bronze sculptures. WhatÃ•s more, the streets of downtown offer shops and galleries that sell local paintings and sculptures of local artists. The city, known for its top-notch services, also has golf courses, boutiques and a marina. Discounted rates are currently available for a limited time.